Coles has a special deal on Abbott’s Village bread. Buy 2 loves for only $6. But it doesn’t appear to have worked for the their newest variety. 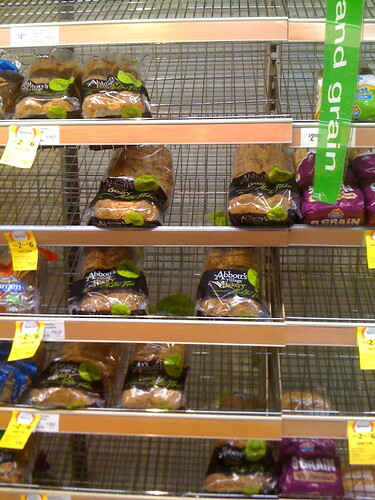 As you can see from the photo, the shelves are completely empty of Abbott’s Village bread, except for that new Malted Flakes loves. So, are people just sticking with what they know? Or is it something to do with avoiding bread with green on it? This entry was posted in Photos, Shopping and tagged bread, Coles, Shopping, special. Bookmark the permalink.